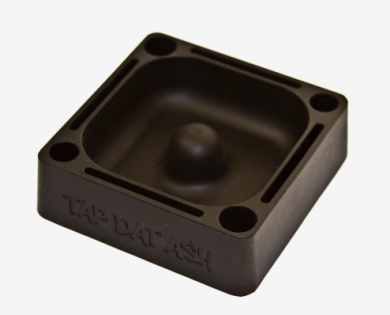 Tap Dat Ash premium silicone ashtray is an innovative alternative to the traditional and often mundane ashtray. The Tap Dat Ash has four holes, one on each end, built in to hold 14mm or 18mm glass on glass bowls specifically, but are also great for lighters, pokers, incense etc. The silicone design is 100% dishwasher safe and unbreakable, resisting heats up to 600° Fahrenheit. Cleaning your ashtray has never been this easy. In the center of the ashtray you will find a rounded point that makes cleaning out your piece even easier, just give it a few taps on the center and nearly all the ash will fall right out. Not only will the ashtray be easy to clean, but you won't have to deal with cleaning any ash off your fingers either.